February 17-26, 2012 was Chicago's Restaurant Week. It's an exciting time for a foodie, I tell you! "Chicago Restaurant Week is a member-based program designed to promote the restaurant industry and drive traffic to participating establishments during a typically slow time of year. For ten days, diners can enjoy value pricing for lunch and/or dinner at dining establishments throughout the city. Organized by the Chicago Convention & Tourism Bureau, Restaurant Week gives local foodies and visitors an opportunity to enjoy prix fixe menus from more than 200 participating restaurants ($22 lunch, $33/$44 dinner). " For the fixed price, it's a great deal. You get three courses and they feed the crap out of you. One may think it's a bit much, but I'm a leftovers girl, and if it's a great dining experience, I don't mind leftovers one bit. Last year, I went to Mercat de la Planxa, which was great. I was disappointed that I wasn't able to try additional restaurants, so I promised myself I'd try several more the following year. And boy, did I keep that promise! 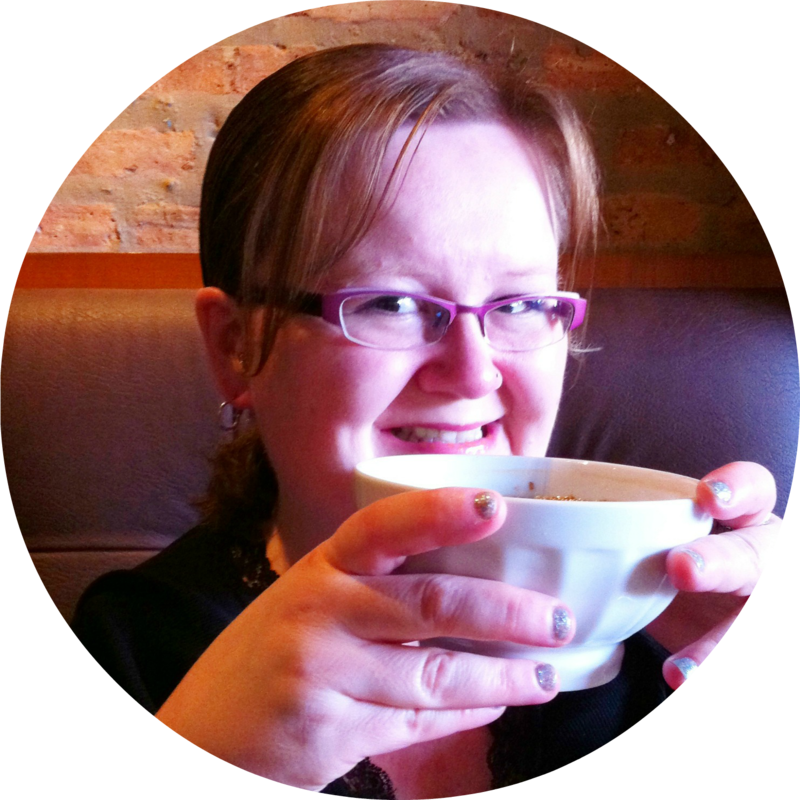 I hope to write about all of my experiences, but I'll start with the standout, Chicago Q, located in Chicago's Gold Coast neighborhood, which I went to with my boyfriend, Tom. You get a very lovely, homey, yet elegant feeling when you walk in, but wow, it's LOUD and a bit distracting when they're busy. We had a 7pm reservation, the wait was only seconds, which made me SO happy, because the place was hopping when we walked in, and usually in those cases, it's almost a guarantee you'll have to wait for a minimum of 20 minutes for your table. If a restaurant does that to me, it pretty much sets the tone for the entire evening. And I'll just tell you, it's not pretty. Service was slow, but given it was 7pm on a Saturday night during restaurant week, I didn't hold it against the restaurant. 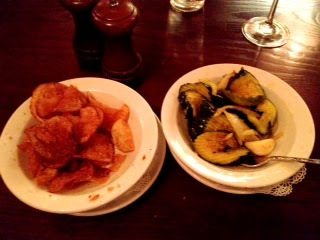 The bus boy was definitely keeping us entertained by filling our water glasses, refilling the chips and pickles, and making sure we were happy, so I have no complaints. Heck, I even tipped him 20 bucks at the end of dinner, because I was so pleased (and slightly drunk). The appetizers were delicious and were seriously meant to be shared or eaten as their own meals. 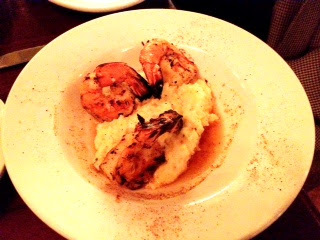 Tom ordered the shrimp & grits and I ordered the BBQ flight. 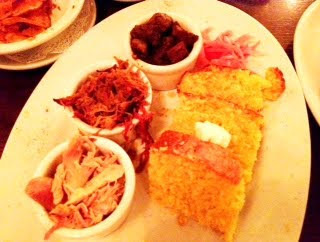 The BBQ flight was a sampling of pulled pork, pulled chicken and chopped Kobe brisket, served with four types of barbecue sauce and a generous helping of honey cornbread. 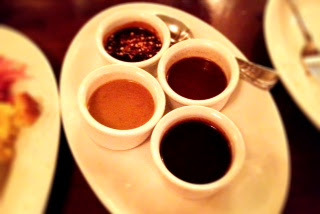 Now let's talk a sec about condiments. At Chicago Q, you could choose from mild, spicy and South Carolina flavors, one was mustard based, the other was vinegar based. I love choices! My absolute favorite was the mustard-based barbecue sauce, as I'm a HUGE fan of anything mustard (with the exception of those pretzel nuggets you find at the grocery store. I just can't get into them.). Mustard is also my condiment of choice, I will basically put it on anything. If you look in my fridge there's usually 4-5 different kinds of mustard in the door. Mayonnaise is just wrong! Dinner turned out to be a calamity of confusion that resulted in us ordering THREE entrees. 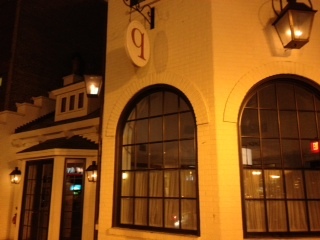 As I mentioned before, the restaurant was crazy loud, so add that plus the waiter a bit of a low voiced fast talker, and not doing a very good job of realizing that we were having a hard time hearing (I mean, could he not have told two people at a table, "you realize you're ordering three entrees?" Oh well.) I got tired of saying "excuse me?" every 10 seconds, so I attempted to piece together what he was saying by catching every 4th or 5th word, but that ended up not being a very good plan. But then again, we ended up with TONS of leftovers, so who cares! Now when I say that some of these restaurants feed the heck out of you, Chicago Q is no exception. I had leftovers for three days and my sister even got to sample the goodies I brought home! 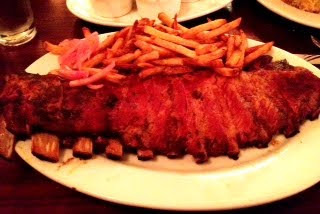 I ordered the St. Louis ribs and fries. The ribs were served dry rubbed, and not slathered in barbecue sauce, which I appreciated, because again I had a choice of four sauces on my table to experiment with! The ribs were meaty, tender, fall off the bone and not greasy by any means. I'm drooling just thinking about those ribs again! Jeez, look at that plate!! That plate alone could easily feed two or three, right? 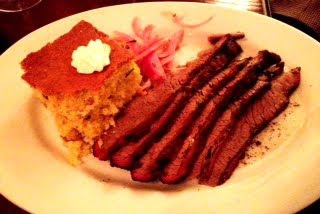 Tom ordered the Kobe Brisket (which was awesome) with poblano cornbread (and awesome) and now is a good time to explain the three entree debacle. As we were discussing options on the Chicago Restaurant Week menu with the waiter, we didn't realize that he was also talking about the regular menu selections (RW menus are separate from the regular menu, but most restaurants will present you with both) and then he kept mentioning, "we only have 5 servings of Kobe left." For a few minutes, the waiter went on about "the Kobe." It was Kobe this, Kobe that, and while the waiter spoke, both Tom and I looked at each other, thought the waiter was referring to the brisket, and since that was Tom's choice for dinner, he told the waiter to place the Kobe order for us now before they ran out. The waiter returned to tell us he was able to successfully able to secure the Kobe order, and that it was going to be served with mashed potatoes. 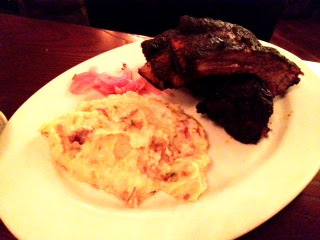 Tom had already ordered the cornbread with his brisket, but we figured it was an additional side, so we shrugged and dug into our appetizers. Those Kobe ribs in the picture look small, but I kid you not, they reminded me of the closing to The Flintstones, when they put the rack of ribs on Fred's car then car turns over on its side. Haha! But seriously, dinner was amazing. I absolutely intend to return to Chicago Q, but during a slower time of day (if that exists) and plan to order A LOT LESS FOOD. Oh dang, I forgot dessert! 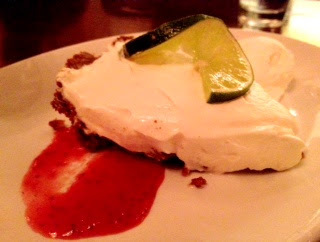 I ordered Key Lime Pie, Tom ordered Carrot Cake. Both homemade, and apparently the owner's grandmother's recipe. 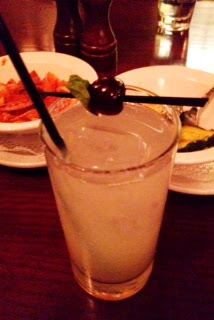 The KLP was creamy, dreamy and heavenly. 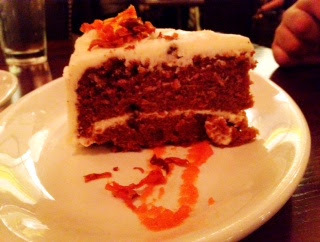 I loved that Tom's carrot cake did not have a thick coating of cream cheese frosting. It was a lovely balance of cake and frosting. YUM! I will follow that link and check it out for future events. Thanks! !